MrsChadT: $400 in CTMH Products for only $99! 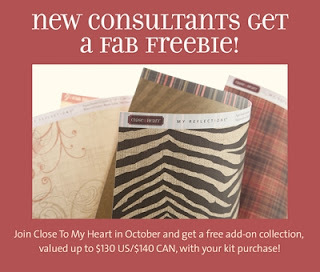 During the month of October, you can get over $400 worth of CTMH goodies for only $99. Which statement fits me best? A. I love to try my hand at new crafting techniques. B. When I am excited about something new, I love share it with my friends. C. I'd like a way to earn money that allows me to be flexible with my time. A. Buy every item on crafting wish list. B. Take all of my friends on a three-day retreat. C. Buy stock in a diverse investment portfolio. What do I find most rewarding? A. Giving someone a meaningful gift I have made. B. Being surrounded by a supportive group of friends. C. Reaching lofty goals I have set for myself. A. A new craft room so I can create to my heart's content. B. Girl's Night Out eight nights a week. C. Financial freedom (or at least some pocket money!). If you answered mostly A's, you would make a great Customer Consultant! If you answered mostly B's, you would make a wonderful Hobbyist! If you answered mostly C's, you would be a fabulous Business Builder!